Since 1943, SHAWCO, the Students’ Health and Welfare Centres Organisation, has developed a reputation for delivering quality primary healthcare in under-resourced communities in Cape Town, South Africa. SHAWCO is a University of Cape Town student-run, non-profit community outreach organisation. 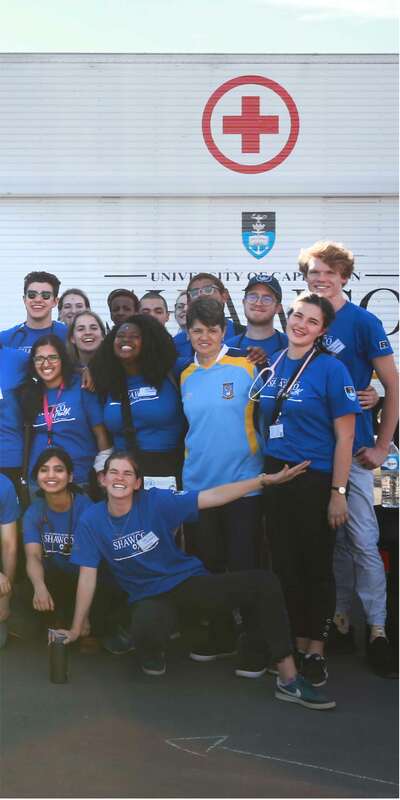 It relies on over 100 volunteer doctors and 800 medical and allied health science students in all years of study to ensure that these student-run free clinics continue to be delivered. SHAWCO Health coordinates six clinics which operate at night on a weekly basis in various Cape Town communities, as well as paediatric clinics every second Saturday morning. In 2009, SHAWCO introduced a Wednesday morning paediatric screening clinic run in conjunction with the School of Child and Adolescent Health at UCT, City Health and Environmental Health. In 2013, a Health and Rehabilitation Clinic was introduced to provide physiotherapy, occupational therapy, speech and audiology services to mentally and physically disabled members of the Mfuleni Community. This clinic now runs on one Saturday morning each month. These clinics often serve as the only port of call for community members who work during the day, or who cannot make the trip to the neighbouring day hospital. The clinics either operate from permanent health facilities or from SHAWCO Health’s three, fully equipped mobile clinics. The paediatric clinics run every two weeks on Saturday mornings, alternating between Imizamo Yethu (an informal settlement in Hout Bay) and Tambo Village in Manenberg, with the Wednesday clinic being nomadic. The Health and Rehabilitation clinic is based in Mfuleni. During clinics, patients are seen by medical students under the supervision of a qualified volunteer or locum doctor who oversees the proceedings, verifies diagnoses and provides advice. Clinical year medical students (4th to 6th year MBChB) are responsible for clerking, examination, treatment and health education of patients, while guiding and teaching pre-clinical students who observe and examine patients under guidance. This fulfils another major role of the clinics: providing education and experience to future doctors and instilling a passion for primary healthcare. 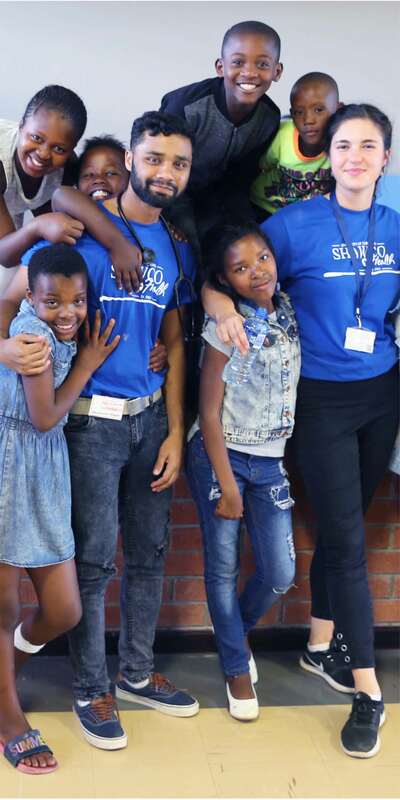 Students who volunteer for SHAWCO clinics say that they are better prepared to deal with the challenges of their community service year and are more likely to stay on in South Africa thereafter. We provide a primary healthcare service, treating conditions such as diarrhoea, respiratory tract infections, sexually transmitted infections, muscular-skeletal ailments, and other non-speciality diseases. We provide holistic management, which includes the wonderful care provided by our health and rehabilitation team: physiotherapy, occupational therapy, speech therapy, dietetics and audiology students who have great dedication in helping provide an appropriate service to the community. The SHAWCO pharmacy, operated by qualified nurses with dispensing licenses, supplies free primary healthcare medication to patients. When we are confronted with a patient requiring a higher level of care or a patient for whom we do not have the facilities to treat, we refer them to the local day hospital or secondary hospital. Students work very closely with community health workers within the community. These community health workers contribute to decisions made concerning the various clinics and help educate patients around specific health issues. Other important aspects of the primary healthcare approach – health promotion and preventative medicine – are also an integral part of SHAWCO Health. This is demonstrated by various methods of health promotion, including health promotion sketches, our partnerships with other NGOs providing waiting room education, and talks complemented by one-on-one consultations by student volunteers with patients. We also provide screening for prevalent conditions, including measurement of blood pressure and blood glucose, pregnancy testing, weight, haemoglobin assessment, and newly instituted VCT (Voluntary HIV Counselling and Testing). The Wednesday and Saturday morning paediatric clinics screen for child-specific diseases.